anderhaff – Teaching. Teaching about teaching. Teaching about teaching with technology. Games as tools to examine all of the above. The video delighted and ensorceled me. The music, the dancing, the costume, the dramatic minimalist synth playing, all of it coalesced into something that made me perfectly happy. I showed it to my spouse in the morning, we laughed about it, and I closed the tab, confident I could easily find the video again when I needed it back in my life. This would not prove to be the case. At punctuated intervals across the intervening months and years, I would spend hours and hours unsuccessfully trying to locate the video again, based on my increasingly-hazy recollection of it. Locating the original forum post (it was gone). Searching through my browser history (too extensive). Searching through my YouTube view history (a sobering journey). Googling many terms about the content of the video (many of which were based on my inaccurate memories). My confidence shattered (I’m a trained librarian, by gosh! ), I abandoned the search for years, until two nights ago (again, up too late), I was struck by the desire to take another crack at it. As the embedded video above suggests, I was successful. The semantic metadata doesn’t exist (this video was relatively obscure). What semantic metadata there is mostly in a language the searcher isn’t fluent in (German). The searcher is basing their semantic searching on false premises or false memories (Example: I remembered the performer’s costume as silver, not black, and based my initial searching on that). Instead, start filtering immediately via factual information. If you are near-certain about a unique phrase, put the phrase in quotes (“where are you”). Identify the kind of artifact it is (music video). Filter by any other quality of the artifact you are near-certain of (it was German). Don’t stop on the first page of search results! It was that search string: (“where are you” music video german) that finally led me to my prize, several pages of search results deep. Was it worth it? Did the video hold up to the immense significance my years of fruitless search had lain upon it? The video is wonderous, of course. The resolution of the journey itself was exhilarating. Yet I’m not certain it was worth all the hours I spent in fruitless search…. …or I wasn’t certain, until I stumbled onto an additional discovery that had me smiling for so long my face literally hurt. This requires a little more personal context: I hate almost all web comments (because I can’t resist reading them, and nearly always feel sadder and dumber as a result). To that end, I run a variety of browser extensions to prevent them from appearing on most websites, including YouTube. 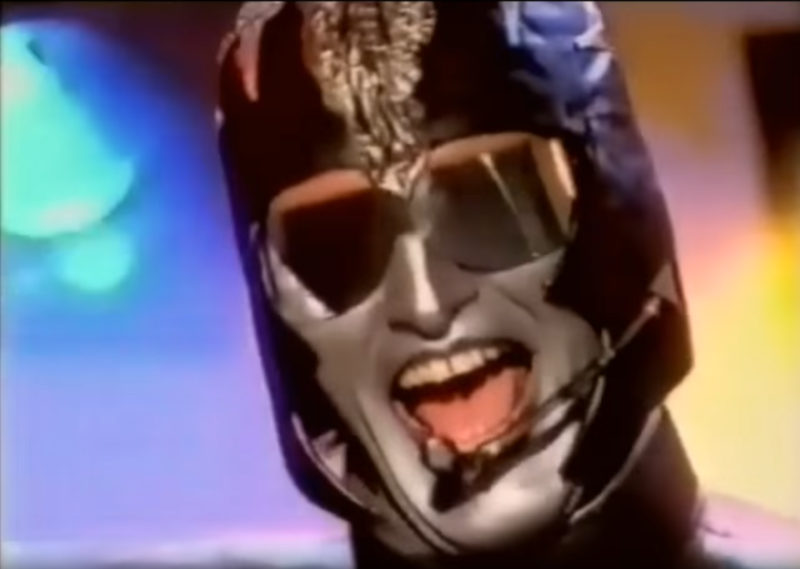 When I rediscovered 16 BIT – Where are you (Long 12” Version Video Clip), it was on my computer browser, where I could not see any comments on the video. When I stayed up too late again last night, I decided to watch the video again. This time, I watched it on my phone, which does not have any of these comment-blocking browser extensions. Because, of course, I could not resist doing so, I swiped down to read the comments, scrolled past the following comment, then slowly back up to it again. The comment was made only 7 months ago as of the date of this writing. Had I found the video before now, during one of my previous fruitless search sessions, I wouldn’t have seen it. Via the commenter’s username, I looked them up, and from a large photo portrait featured the website of their Berlin-based relationship coaching practice(! ), I confirmed that it was the same person, 20-odd years later, though not so futuristically-garbed or silver-faced. They looked happy and healthy. What began as a strange artifact of cultural runoff, and became an inane personal obsession (one I was finally able to satisfy), has yet further transcended for me into an oddly-meaningful human connection across time and space, a silly statement on time, ageing, and memory. I’d lost something, and when I found it again, it ended up being even more than I’d dared hope for. Something really, really absurd. Getting the right people, in the right place, at the right time, to establish shared goals. Collectively communicating those goals and carrying them out over time. The reason this is so hard is that every single part of that process is difficult, particularly within the existing patterns of work and life for busy, productive faculty, students, and staff at a modern university. 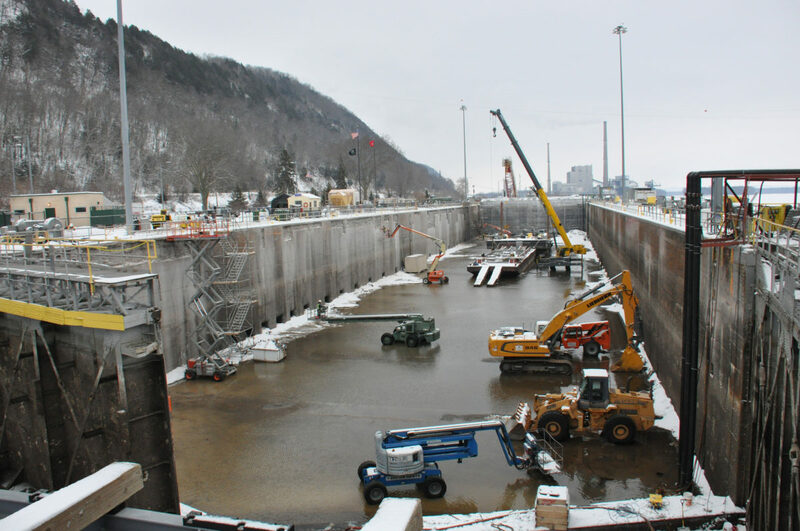 What if, as Michael Feldstein writes in the quoted article above, buy-in could be culturally re-framed not as knocking obstacles aside, but as building infrastructure? This is hard to do! Even starting from a firm, stable footing only goes so far without monitoring, maintenance, and reaffirmation. None of those concepts are alien to the work of the university, but they do require a reshaping to day-to-day priorities. On Monday, October 22, 2018, Anthropology professor Krista Harper and I hosted a gathering of University of Massachusetts Amherst instructors: Game-Based Learning Community of Practice: Make a Game for your Class. The session was built on the premise that games emerging out of the loose heritage of the popular card game Apples to Apples (we chose to label this category of games “Judge & Justify”) had many features that could be adapted into productive and engaging in-class learning activities. The participants played a few hands of Cards Against Anthropology, a game about assessing appropriate (or wildly inappropriate) responses to issues that can arise in anthropological fieldwork. Krista and I presented on the heritage of Judge & Justify games, the affordances & constraints of this family of games, and ways to assess students who engage with games like this. See our presentation (pdf). Participants split into 5 groups of 2-4 and spent about 30 minutes developing game prototypes based on their own instructional goals. See the game design handout we provided (pdf). The groups presented their game prototypes, along with the game materials (card examples, rules text, etc.) that they had produced. The 14 participants, split into 5 groups, produced 5 solid game prototypes: sample game components, assessment plans, and all. In the anonymous evaluations filled out by participants, all expressed that they were “extremely satisfied” with the experience. Assessing symptoms and patient history to diagnose conditions. Deciding on appropriate behaviors in the context of service learning and cross-cultural group communication. Curing “monstrous” varieties of cancer. Improving student critiques of their peers’ animation work. Examining modern artifacts and well-known heritage sites through an “objective” descriptive lens. What’s Next and What Could Be Improved? There is an opportunity for a longer-form (half-day?) game design workshop focused on helping instructors build out near-complete game designs for their classes. We briefly discussed how Judge & Justify game activities like this could be adapted for online and remote learning spaces, but I felt like I gave it short shrift. We could have given more explicit prompts for what participants could do next after the workshop ended: offers for individual consultations, future events, etc. If you have trouble accessing these documents, email me at sam dot anderson at umass dot edu. A new report called “Making Digital Learning Work” (authored by Arizona University and the Boston Consulting Group) summarizes case studies on “digital learning” efforts taking place at Arizona State University, Georgia State University, Houston Community College, the Kentucky Community and Technical College System, Rio Salado Community College, and the University of Central Florida. Higher Ed futurist and commentator Bryan Alexander had a good take on the report. If you don’t have time to read the whole report(or just the executive summary), Bryan’s piece is more informative than what follows from me, and I’ll not duplicate his expert read, which I largely agree with. The meanings and definitions of words and concepts in the report shift around in ways I find pretty questionable. There’s a lot of good and potentially information here, but unfortunately, much of the information is obscured by the inconsistent use of various terms and names. The same term can be variously used to describe a student, a software product, an academic program, an individual course, or a major institutional initiative. Now, part of this confused verbiage comes from this report being comprised of case studies of 6 different schools, most of which have multiple initiatives going on at once. Unfortunately, I’m also concerned that this confusion is being fostered deliberately in order to make positive findings about specific applications or contexts seem more all-encompassing or broader in impact. For example: In almost every part of the report, the term mixed-modality is used to refer to an individual course that offers a mix of online and face-to-face elements. Then, midway through the report, under the heading “Mixed-modality learners experienced improved retention and graduation rates.” studies showing that students who take a mix of fully online and in-person classes sometimes do better than students taking only in-person classes are discussed. Findings like these “further reinforces the value of mixed-modality models.” In this subtle drift of the usage of the term mixed-modality from “course” to “learner,” the positive messaging around a specific usage is seemingly rhetorically stretched to all usages. Conversely, I noted instances where positive results from large-scale or holistic initiatives are used to bolster more limited (but similarly-named) applications. I noticed this particularly around the term “adaptive,” where the successes of large-scale course and curricular re-designs (referred to as “adaptive courses”) that incorporated adaptive courseware as well as major learning space and enrollment changes were used almost-but-not-quite interchangeably with discussions of the courseware specifically. The report views the harvesting and exploitation of student data as a near-universal good. There’s obviously much that can be gained by exploring the data that students produce; but in a post-Cambridge Analytica world, we can’t pretend that this is a morally neutral act anymore. danah boyd of Microsoft Research (author of It’s Complicated: the social lives of networked teens), recently gave a talk at the big tech/media/culture conference SXSW called “What Hath We Wrought?” (46 min, 14 min of Q&A) that’s been getting a lot of notice in among scholars of the intersections of media, tech, and education. I found this talk to be a useful review of the recent media landscape, how it is being exploited and (mis)interpreted, and some of the motives people have for that exploitation. Stay or skip to the end (about minute 54) for a fascinating history lesson about the origins of Twitter! Renee Hobbs of the Media Education Lab (affiliated with the University of Rhode Island) shared their concerns that boyd was oversimplifying and misunderstanding the actual work of media and information literacy in their response, Freedom to Choose: An Existential Crisis. In an attempt to give an exhaustive account of my experiences at Domains 2017 (June 5-6, 2017), I fear I have very early exhausted myself. The conference was such a remarkable and singular experience for me that I felt the need to honor it with as thorough a documentation and compilation as I could. That effort almost resulted in this post never being completely finished or published, so I have decided to let it go and simply post it. What follows are an accounting of compiled notes and memories from the presentations, projects, and discussions I experienced in roughly chronological order. Where possible, I use the heading for each of the following to link to the presentation materials, tool, or topic concerned. Rather than drop these scattered notions to the bottom, I place them here because I want to remember them in particular. 1st assignment: highly structured, step-by-step, copy and paste “about me” page. Final assignment: blank slate expressive “about me” page to replace the former. Pushing course blogs to the front page of a Domains site helps attract more courses. Spotlight students to attract other students. If an institution’s Domains front page just looks weird, clunky, and silent, there won’t be nearly as much realized potential. Field schools and other “remote” scholarly work. 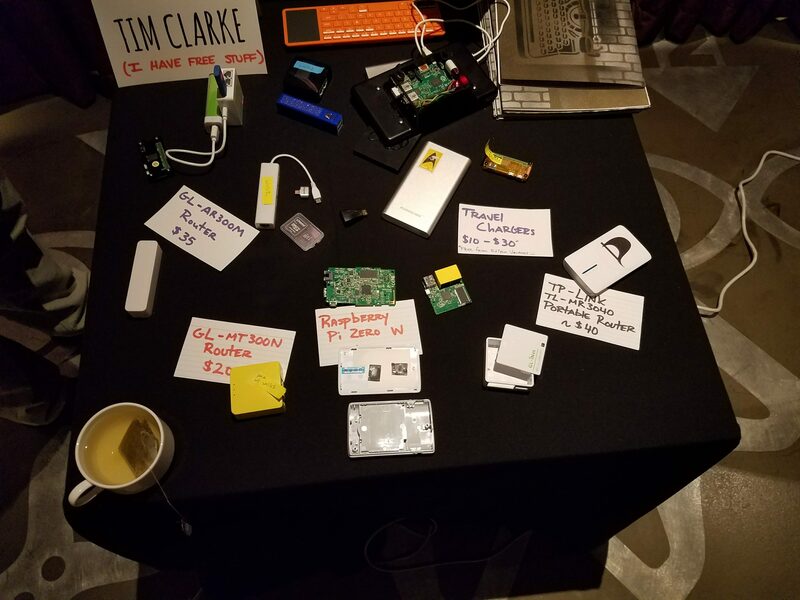 I believe that I connected to the device on the uppermost left side of the table. 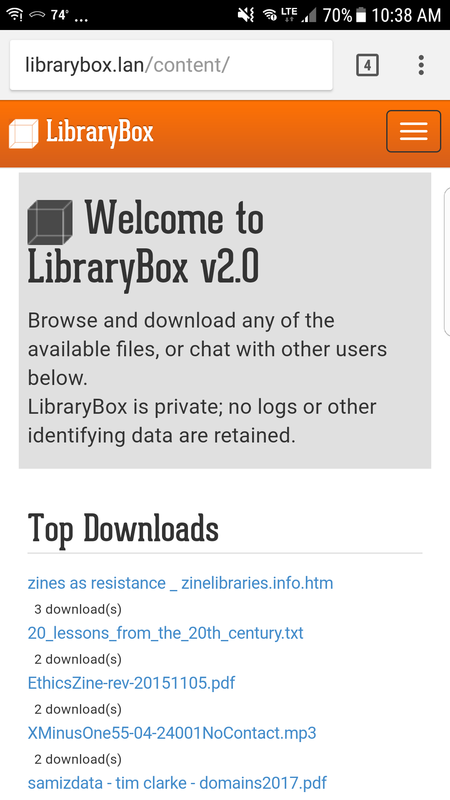 My phone connected to Tim Clarke’s LibraryBox. 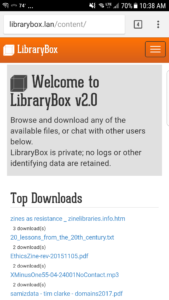 Adam Croom has done a more recent write-up (The Offline Web) on his thoughts and experiences around LibraryBox/PirateBox. Oklahoma U’s faculty development series on the web. Faculty are encouraged to “visualize what you know about the web” right at start and again at the end, and mindfully compare their two views. The facilitators started with the ground-floor, concrete level bits and pieces of the web: files, servers, FTP. The aim seemed to have been pure demystification, letting faculty touch and see the “real stuff” that made up the web. Please read it. The other specific thought that occurred to me: Breaking something can make you realize you had power over it, and fixing it can show you that you can control that power. The trick is how to shape an environment where folks can come to those two realizations. We should build a student advisory board for UMass Create! We need student voices, and we need to bring students together. Something like Muhlenberg’s Domains and Donuts (see below): A specific, bounded time for Domains users to get together to work and support each other. Much of the important elements of this presentation are covered in the linked post, but I never pass up an opportunity to highlight one of the projects mentioned: the Digital Polarization Initiative. They went to departments already using portfolios or with interest thereof. They got the director of Gen Ed and the dean the College of Liberal Arts on board. They first cohort included four first year experience classes and four 400 level courses. They held workshops for the faculty cohort the semester before and met before the semester started. They curate and spotlight sites (student site, course site, faculty blog) on their domains site home page. They noted that they ask permission before they spotlight someone’s domain! Tom Woodward of VCU also presented some clever and (relatively) simple ways to scrape and display usage across WordPress sites installed on a domains instance, capturing screenshots of the site home pages. He also showed a method for pulling out a timeline of posts. In response to a concern I raised about how that usage data, once collected, could be used against users, the presenters responded (in what I hope is a reasonable paraphrase): The more ways to look at something, the more facets reveal themselves, and the more developed and productive discussion to be had about usage. Jenna Azar (Muhlenberg) & Jarrett Azar (Muhlenberg). Jenna runs the Digital Learning Assistants (DLA) program, an undergraduate student-staffed, student and faculty-serving support service focused on domains. Jarrett is a Class of 2020 student and a DLA (yes, they are parent and child, which is great!). The pre-orientation was and exploration of tools and apps, framed by conversations about being a learner and citizen in a digital age. This ranged from using a local Snapchat filter to advertise a dance party to readings of Freire, Vygotsky, & hooks. While they hoped this pre-orientation cohort would produce Digital Learning Assistants, they didn’t make it a requirement. Each DLA can choose to focus on 1 of 4 areas (based on my imperfect notes): mapping, publishing, storytelling, archives. There were 8 DLAs in the first year of the program, offering open hours in Spring 2017 after more focused spin-up in Fall 2016. These open hours operate a lot like UMass Amherst’s Instructional Media Lab, in that they are helping students and faculty teach themselves, not going in and solving problems themselves. Every other Friday, the DLAs came together to do domains work, with a healthy supply of donuts on hand. This was open to faculty doing domains work, too. It wasn’t exactly a drop-in support and service space, more of a drop-in community support space. In other words: “I’m going to install this thing on my domain and I’m pretty sure I’m going to break it, so I came here to have folks to talk about it with.” I like a lot of things about this model. It emphasizes peer support, it’s a specific community time and destination rather than a nebulous office, and it has donuts! We’re doing some similar stuff at UMass IT Instructional Innovation with our Techspresso Retreats, but I think we could consider the benefits of the specific topical focus and the peer/community support concept of Domains and Donuts. Tanya Dorey-Elias started by noting that we were on unceded native (or aboriginal, in .ca terms) land. I’ve increasingly seen this practice in conference panels and other framing of North American spaces, and I appreciate it every time. My own lack of confidence in bringing that up in similar contexts just indicates a lack of research on my part about the land I’m on at any given time. Tanya started with an amazing exercise and framing metaphor about boots, the context in which they are used, and how this connects to other technologies. Happily, she wrote this up and frames this much more powerfully than I could. Alan Levine highlighted some SPLOTs: “SPLOTs are the demented spawn of a shotgun marriage, between the drive to simplify open web expression and the refusal to require participant data.” He specifically showed off Tru Writer. This presentation was about the trevails of running a huge multisite WordPress site similar to blogs.umass.edu. Tom’s excellent presentation is linked in the title, so I’ll pull out my big takeaway: The blogs.umass.edu multisite and UMass Create web domains should be mutually-supporting tools for our population. We shouldn’t ignore one for the other, but should highlight the difference in affordances and constraints. BYU Domains has 5800 users, which is the largest current DoOO instance with Reclaim Hosting. BYU started their pilot in 2015. By end of the year they had 1000+ sies. Started with “techie” groups. They went “live” as a full service in Jan 2016. Peter shared that his CIO is a little disappointed in the “5800 sites” figure; he wants 10,000! The majority of use is from students (about 65%). The usage isn’t as centered around classes, but mostly around individual users. For example, at least 30 of the sites are students selling their photography. How do they de-provision accounts? Check for Active User (“eligible to register” student or employed faculty/staff) in the general IT information system. If they aren’t active, show a notice on the site dashboard (cPanel). warning with a link to their site migrations page, as well as the RH individual hosting purchase form. Side note: RH is getting a burst of BYU folks transferring out of BYU to Individual Accounts. Send a monthly email for 6 months. After 6 months disable the account, 1 month later delete account. How do they auto-provision accounts? The system checks if they’re an Active User (see above). If so, a WHMCS (domain) account and a WordPress account are auto-created. A welcome message is sent to them with an invitation to log in and choose a domain name (including support info). No IT staff have to take action throughout this process, though they contracted an outside developer to build the above two processes. The IT staff does lots of presenting to classes about digital identity and sovereignty every semester. Presentations aren’t focused on the technical, but more values-driven. They publicly kick out the faculty member from the class when they present to students; make it clear that it’s “about students.” They make sure a given class presentation aligns with the syllabus, too. Students are used to jumping between multiple online spaces for their scholarly work. Specifically, the Center for Teaching built and runs an LMS, and IT also supports Canvas and Moodle. Finally, almost everyone uses their personal email rather than their BYU email to register or access services at BYU. The sense of the “one-stop-shop” or “walled garden” just isn’t there for most of the BYU population. TIm’s talk was more strategic and aspirational, framing the original purposes of the LMS, what it has become, and how a more distributed system, with individual learner domains as the nodes, could actually promote a more useful and enriching environment, especially for the kinds of “distributed, life-long learners” that make up an increasing amount of students. I spent my lunch reading over this report (“The Future of Free Speech, Trolls, Anonymity and Fake News Online” compiled by the Pew Research Center) and have skimmed through the rest. The summary is probably a 10-15 minute read, and the major findings of the report (the first page) is probably more of a 45 min read. P.S. and disclaimer: I’m actually quoted in it (click here and scroll up a bit)! “The only factor that couldn’t be ruled out was the race associated with the colleges involved, Mayew said. Here’s the journal article itself. I recently finished Deep Work (2016) by Cal Newport, a writer and computer science professor at Georgetown. I read a lot of “productivity lit,” and while Deep Work definitely falls into that category, it offers a lot of practical framing for how individuals and organizations can structure their work environments to help produce better, more meaningful outcomes. I recommend reading the book if you’re interested, but this 30 minute interview with Newport (embedded below) hits most of the high notes; the interviewer is engaged and knowledgeable, and they both share a number of specific practices and stories about how the topic relates to their work. Here’s the audio version via iTunes. Newport also writes a fine blog, Study Hacks, which goes into detail on specific tactics for deep work and related topics. 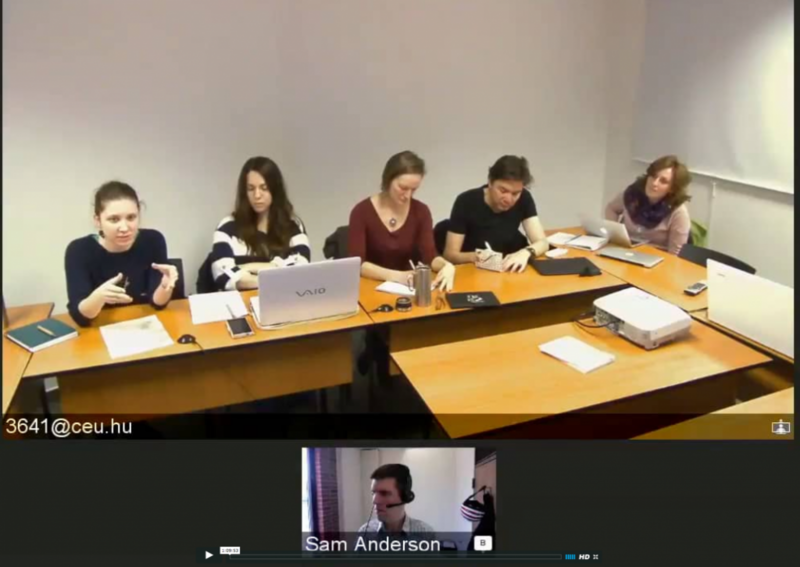 I (virtually) visited a Political Ecology and Environmental Justice graduate class in Budapest to help them with their game design projects a few weeks back. I thought it was a great session, and I hope the students got useful feedback from me and my co-panelists. We thought we had figured out the time zone scheduling, but were nearly undone by only realizing at the last minute that the daylight saving switch happens weeks apart for our two countries. Tell the students up front how hard I find it to present creative work for critique, and that I would have been considerably more anxious in their shoes. Couched my suggestions in less declarative terms.